As we age, we’re at greater risk for systemic illnesses like diabetes, heart disease, and stroke. What many patients don’t know is that gum disease increases your risk for and the severity of your illness. Gum disease has been connected to numerous whole body health issues, and unless your periodontal health issues are treated at the same time as your whole body health concerns, you may not be adequately addressing either. A skilled dentist can help you understand how gum disease and other oral health issues can impact your whole body and help you to maintain complete health. The key to keeping your smile healthy for life is to visit your dentist at least twice a year for dental checkups. These biannual appointments give your dental team the opportunity to screen for common warning signs of dental disease or damage and partner with you to prevent many oral health concerns before they begin. We can walk you through how best to care for your smile at home between office visits. 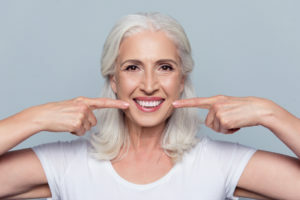 Skilled preventive dentist, Marianna Gaitsgory, DMD, and her team at Framingham Premier Dental offer personalized oral health care plans to ensure patients’ smiles remain healthy at every age. For senior patients, that may mean changing oral hygiene products, visiting us more often, or partnering with your physician to maximize the efficacy of oral and overall health care plans. If you’re ready to start your customized treatment plan at any age, call our Framingham dentist and team today. We’ll partner with you to create a plan that will ensure you keep a healthy, beautiful smile for life.